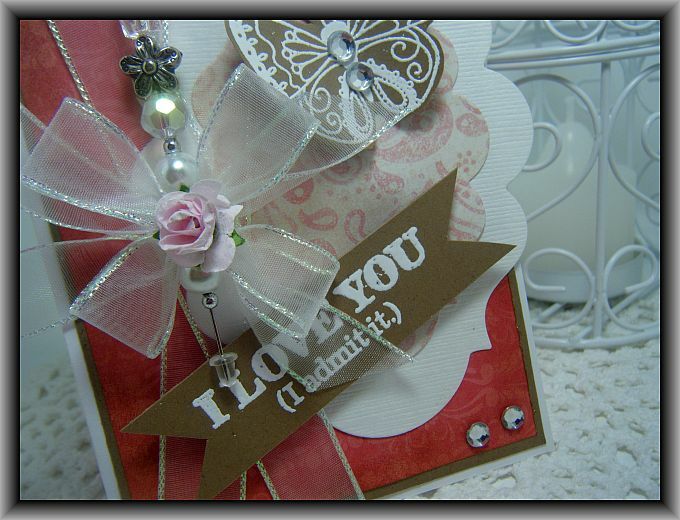 I have another simple little valentine to share with you this morning…. I dug into my scraps to see if I could find some suitable scraps to make up a few of these clean and simple cards and I think it turned out pretty well. I used a little bit of modeling paste to make the little heart on the bottom right hand side. I am off to work again today and we are again bracing ourselves for a major storm here late this week. I simply can’t wait until winder is over! I have another sweet little Valentine card to share with you tonight. I think this one is my new favorite…. I really like the subtle white heat embossed X’s and O’s and little hearts. I added some pretty red glitter paper under the white hearts to bling them up. Again this is a very simple design but I like how elegant they turned out. 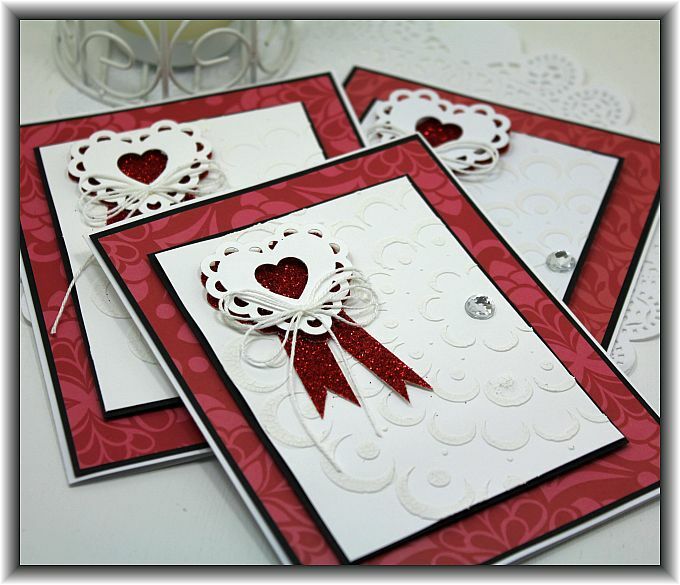 I’ve been busy making a little stash of Valentine’s day cards…. I had so much fun using my stencils to make my canvas art, I thought I would start using them on my cards as well! I have to say, Modeling Paste is truly one of my favorite things to use! I love the pretty designs they make on my projects. 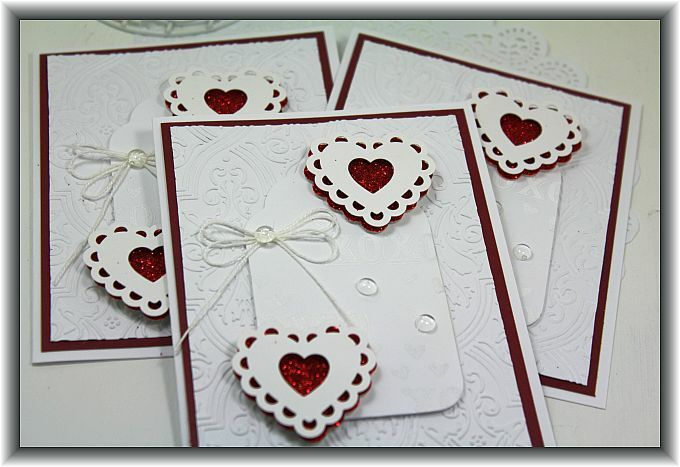 These turned out to be very simple but elegant cards! The heart punch is by Martha Stewart. It is one of the layering punches and I used a smaller heart punch to punch out the center of the top heart. They were quick, easy and fun to put together! I hope you all are having a fantastic weekend! I have been laying low this weekend trying to get rid of this ridiculous flu, it has been dragging on for what seems like forever! I need to get on the other side of this and back to work this morning! 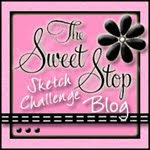 I haven’t been very crafty this week while I have been sick but I have loads of projects stored up to share with you. 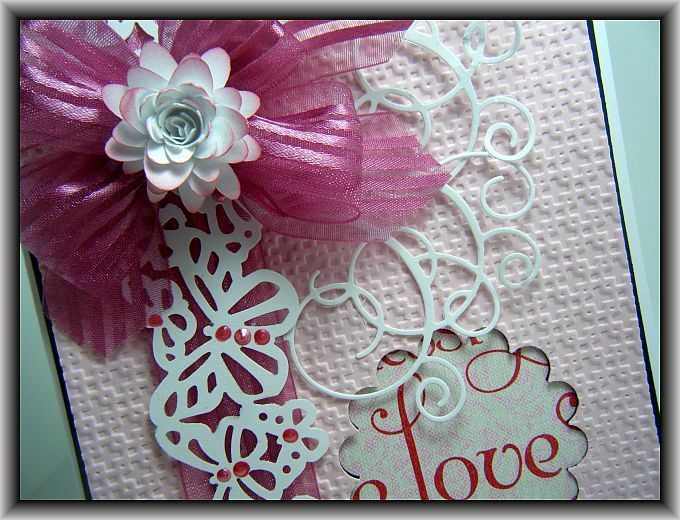 This was made using the Martha Stewart deep edge Scroll Heart punch. This punch belongs to my friend Carol and it is absolutely my favorite edge punch… I use it often and I think I am going to have to buy her a new one because a tear comes to my eye every time I think she may want to take it back! LOL!!! 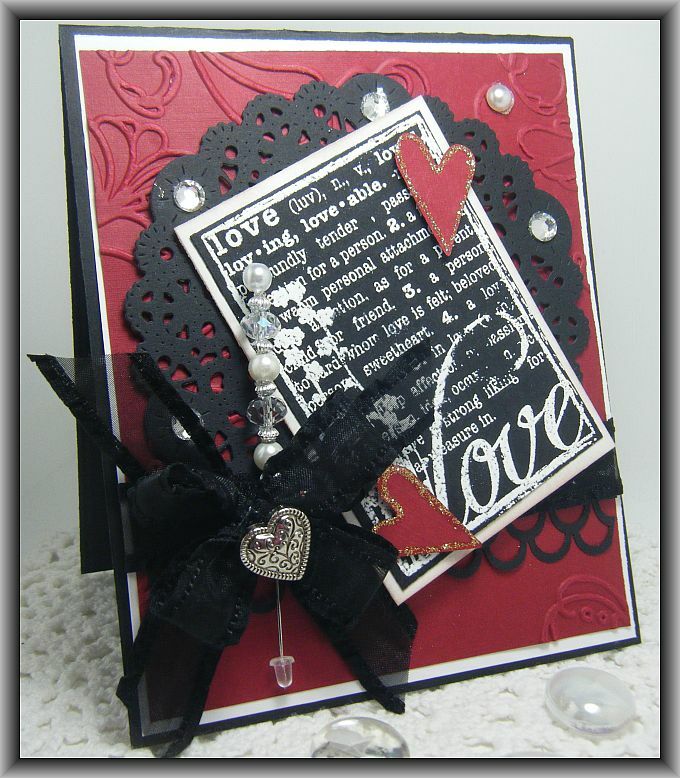 I love the layout of this card, it would make such a lovely wedding or anniversary card don’t you think? Well I am off to get ready to start my day. I hope you all have a great day and thanks for stopping by! This is my entry for LAST week’s Alphabet challenge. I am late…. Sorry Diane!!! Better late than never huh?? Last week was the letter I so this is what I created…. Not half bad for a rush job right? Diane has put a fun spin on her challenges, you should really check it out if you are looking for something new to try… she’s doing a fantastic job!! Here’s the link to the Alphabet Challenge thread. Diane just posted the letter J challenge today! The paper is from a new paper pad I picked up by My Minds Eye – Lost & Found. 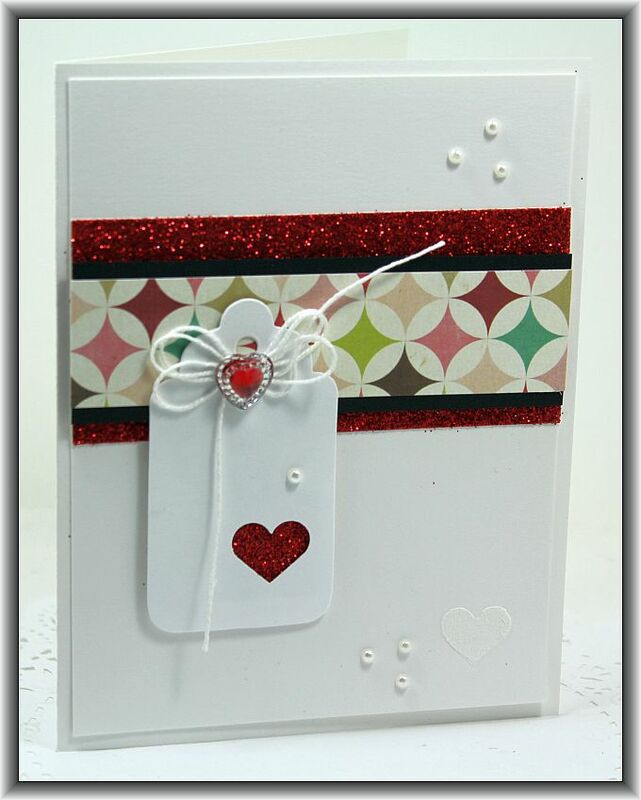 I used Labels Twenty to make the decorative die cut under the butterfly. 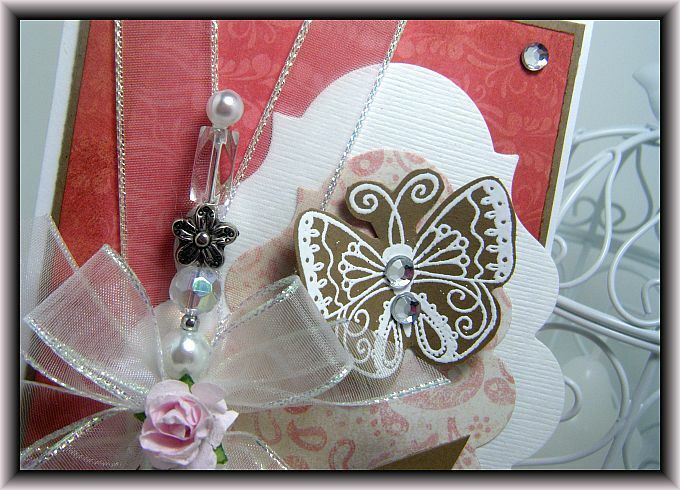 I found that cute little butterfly stamp in the $1.50 bin at Michaels and heat embossed it using Martha Stewart bright white embossing powder over craft paper. 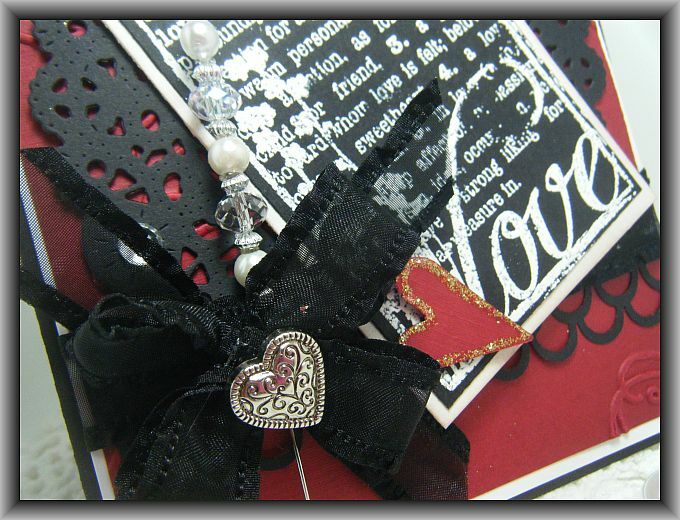 The cute little sentiment stamp is by Inkadinkado – I Admit It. I originally picked up this stamp for Valentine cards but I really like it and I think it could be used for more than just Valentines. I glued some beads on the pin and made a double bow and toped it off with a pretty pink rose that matches the lighter pink paper under the butterfly. So there you have it! That’s letter I…. now on to Letter J! 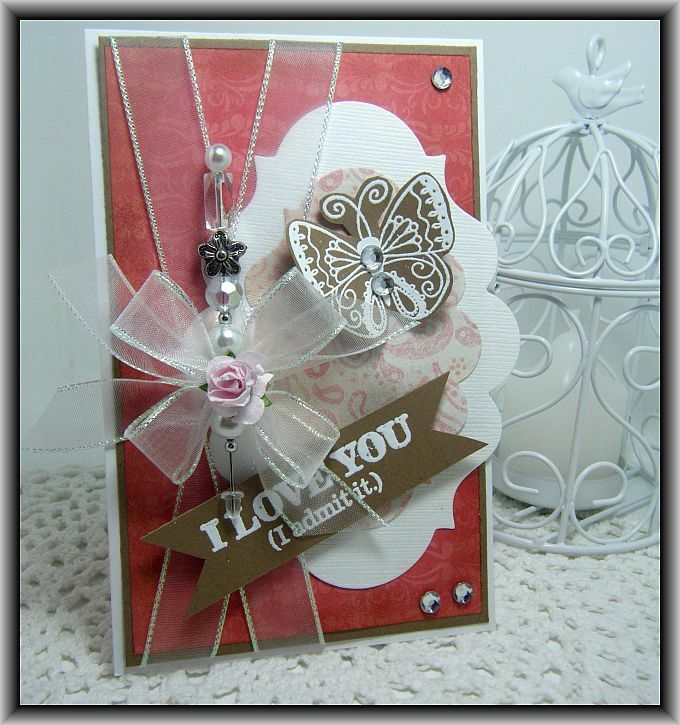 I made this card a couple of weeks ago while I was playing with all the lovely craft supplies at The Cutting Garden. 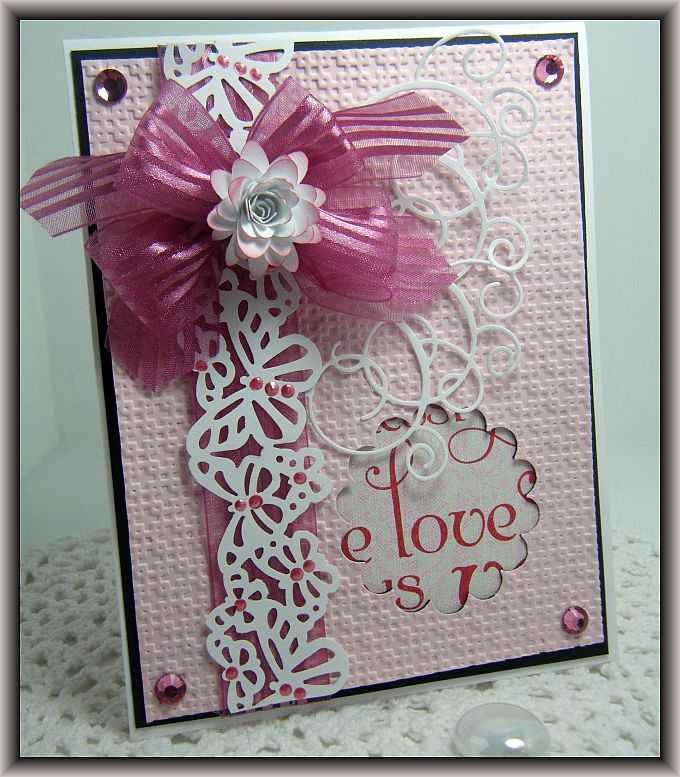 I love this embossing folder and have put it very high on my wish list after making this card!! 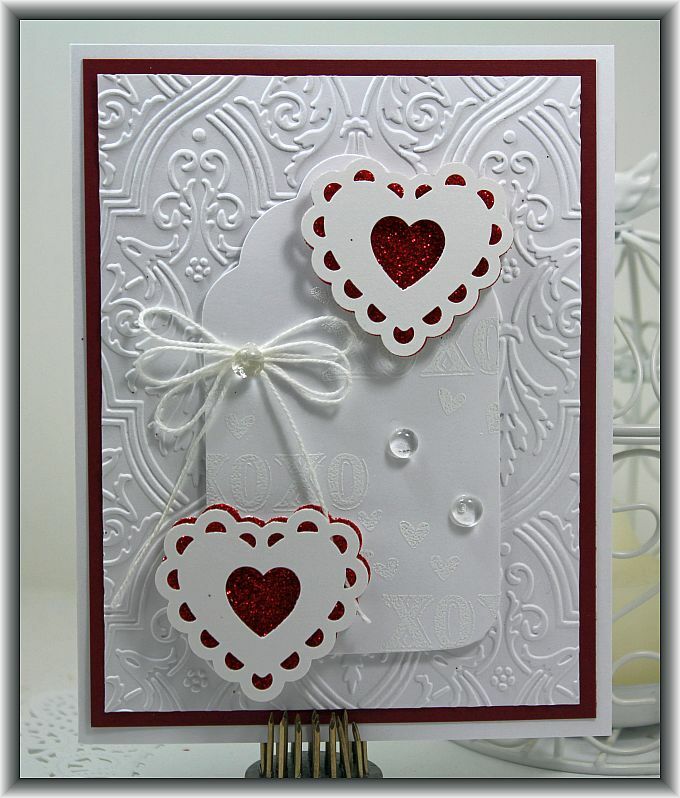 This was such a quick and easy valentine card to make! When I started it, I had an entirely different thing in mind but this is what I ended up with. I am pretty happy with the result! 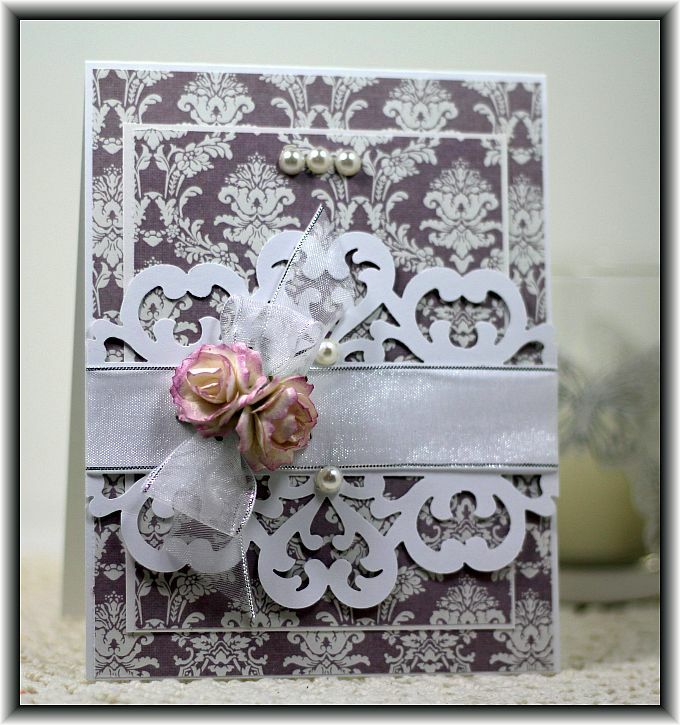 I love that Martha Stewart Butterfly border punch and the lovely Memory Box Elegant Scrollwork die. I made this card at the last Crop Night at The Cutting Garden http://www.thecuttinggarden.ca/ We had a great time and the place was packed!!! I am giving this card to Tony for Valentines day, I am sure he will like it 🙂 Here’s that Cheery Lynn Doily die again! LOVE IT!!! The stamp is made by Hampton Art. 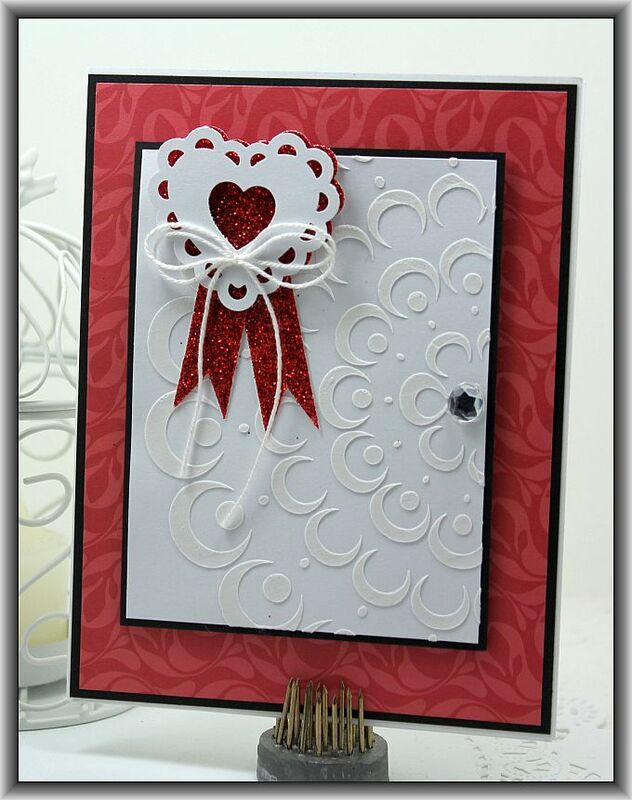 The embossed background is the Elegant Lines embossing folder by Stampin’ Up!. Now have a look at that ribbon…. I picked that up at The Cutting Garden, it has a lovely ruffled edge to it and they have several colors in stock. Hmmmm wonder how much I need to whine to Kim to get her to order it in white and pink? 😉 I am SO addicted to ribbon LOL!!! Hope everyone is having a great evening!